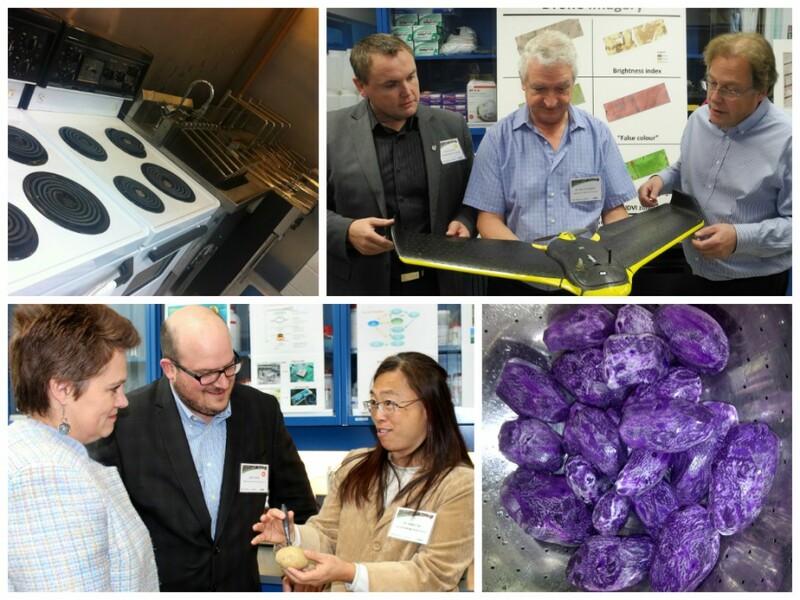 On November 26th the Potato Research Centre (PRC) in Fredericton opened its doors for Stakeholder Day, an exclusive industry event that showcased its facilities and research and development capacity for the first time in 8 years. The PRC is a federal research institute with world-class talent and capacity residing right here in New Brunswick. The goals of Stakeholder Day were to raise the profile of the PRC and open the doors to engaging with industry as well as to showcase the talent and capacity resident one of this country`s oldest federal assets. Stakeholder Day is hopefully the first of many events that BioNB will support to draw attention to the research capacity and world class infrastructure assets that New Brunswick has. Potato is a leading world food crop and an increasingly important food source for developing regions. Cultivated potatoes are prone to pests and pathogens so it’s important to understand the potato for better crop management. New Brunswick alone exports over $1 billion in potatoes every year, a successful industry that is supported by cutting-edge research at the PRC. Touring a high tech research lab is just as interesting as you’d think. Guests at Stakeholder Day were treated to laboratory tours of the Potato Research Centre where a number of scientists hosted discussions on their current research. Members of industry were actively engaged, spurring important conversations about current issues in the field, potential solutions, and the possibility of new industry-research partnerships. The PRC houses 20 labs supporting expertise in molecular biology, genomics, plant breeding, soil nutrition, water quality, and more. 16 professional scientists and 40 technical staff collaborate internationally on industry-driven projects. It was clear from the presentations at Stakeholder Day that the staff is very passionate about their work, and the caliber of their research is truly world-class. BioNB had the opportunity to interview three of the PRC’s top researchers. Read about the current research of Dr. Claudia Goyer, Dr. David De Koeyer, and Dr. Helen Tai. Between tours, Stakeholder Day featured presentations on the agriculture industry in Atlantic Canada, current research projects at the PRC, and funding options for industry lead projects. The end of the day was nicely wrapped up with “Opportunities Rooted in Innovation,” a panel discussion around New Brunswick’s research assets, and how industry can better take advantage of the capacity available in the Potato Research Centre. “We have a lot of talent and expertise within this federal asset, and we should help them wave their flag,” said BioNB Executive Director and panel moderator Meaghan Seagrave. The conversation shifted to how bioscience is the best tool for New Brunswick to leverage its strong traditional sectors. “No matter where you live in New Brunswick we are a resource-based province,” said Joey Volpe, Industry Liaison Officer at CCNB. “We are strong where we are strong. Let’s work on that.” Bernadette Fernandes of NB Economic Development pushed for collaboration between the research and entrepreneurship communities, while Ken Forrest of Ignite Fredericton urged better promotion of bioscience success stories to illustrate our true strengths in this region. With all of the technical talk around potatoes, it’s easy to forget that potatoes are enjoyed at the dinner table. Stakeholder Day aimed to cover all aspects of the crucial crop, so the organisers recruited the talented Chef Leanne Wiens of LJW Catering to prepare a truly unique potato-rich lunch. 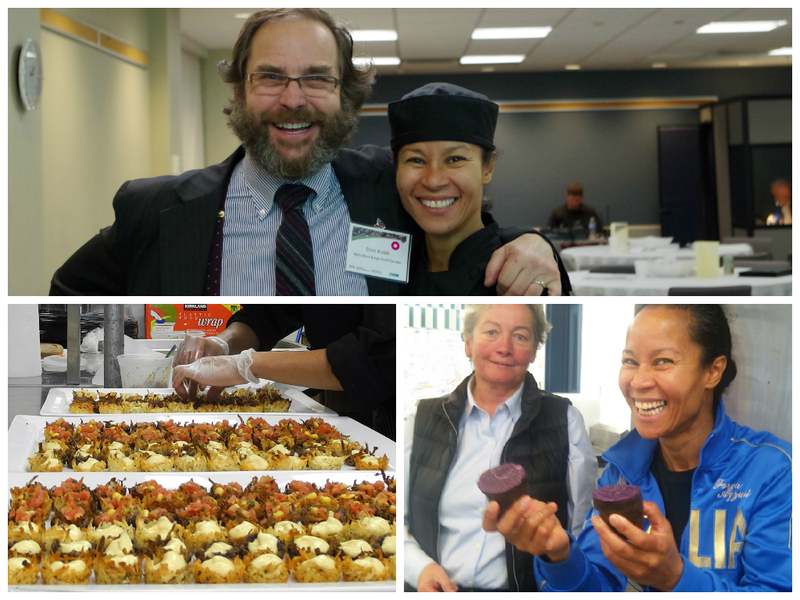 Chef Wiens met with Research Scientist Agnes Murphy to select six different potato varieties from the AAFC inventory. Chef Wiens learned about the science of the potato to guide how she prepared each variety. “I wanted to highlight the potato, to truly represent its texture, taste, and smell,” said Chef Wiens. “The best way to accomplish this is with a ‘less is more’ approach”. Click here to access the menu, recipes, and information about each variety. Although Stakeholder Day was packed with activities, the goal of the event was to demonstrate the research and development capacity available at our disposal and to help facilitate networking and partnerships with regional industry. When asked about their experience at Stakeholder Day, many guests from industry revealed they had discovered new synergies with researchers at the Potato Research Centre. Stakeholder Day was well-received by all, and is a great model for other research institutions to follow to increase their profile and engage with industry. Contact BioNB for inquiries on Stakeholder Day or possible partnerships on future events.